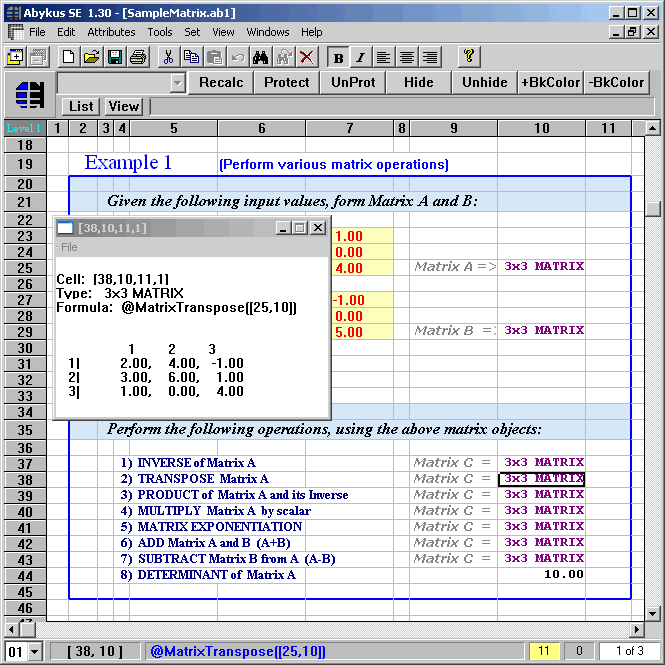 Spread32 is a tiny, basic spreadsheet program that supports formulas with over 300 functions, sorting with multiple keys, freeze panes etc. Due to it's size, the program is limited to 256 columns x 65536 rows x 255 sheets. Note: The original program has gone shareware -- the last freeware release can be found in the download link. Writes settings to: Windows registry. Stealth: ? No. Saves settings to 'HKCU\Software\Bye Design\Spread32'. How to extract: Download the ZIP package and extract to a folder of your choice. Launch Spread32.exe. Fixed a bug with chart sheet tab colors not being saved. Fixed a bug with defining names that are not references. Fixed a bug with load/save of Japanese Yen symbol. Fixed a bug with references being corrupted after a sheet is moved. Fixed a bug with the formatting of cells containing hyperlinks. Fixed a bug with some text boxes not loading correctly. Fixed a bug with some chart data labels not loading correctly. Fixed a bug with printer information not being converted correctly between Excel 95 and 97 formats. Fixed a bug with loading autofilter ranges containing blank rows. Added support for file auto_open macro. Added the GOAL.SEEK, ON.SHEET, SELECT.END and SELECT.LAST.CELL macro commands. Added the ISPMT worksheet function. Added support for Book.xlt special template file for default settings. Added support for numeric keypad local decimal character. 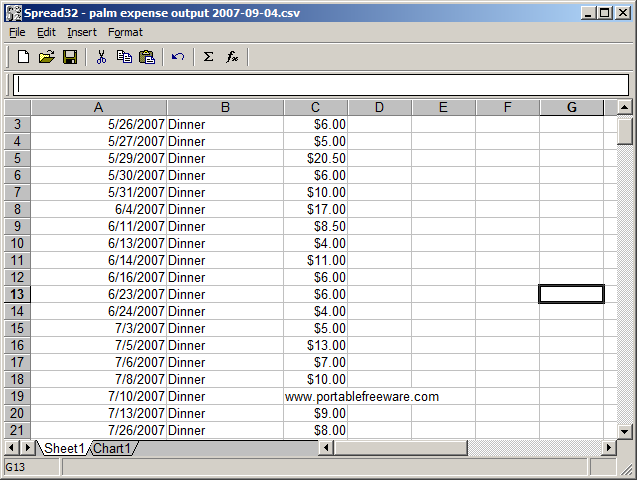 Added support for load/display/save of autoshapes in Excel 97 files. Added support for line/fill colors and font formatting in text boxes. Added support for decimal seconds when entering time values. Changed the FORMULA macro command so that the target cell format is not reset. Improved accuracy of FINV worksheet function. Full changelog is at http://www.byedesign.co.uk/devdiary.htm. I've been using Spread32 version 1.18 for over ten years! Where have any of you been? Using M$ Excel or OpenOffice Calc? Gnumeric is a fast, accurate, fully-featured spreadsheet that supports a wide array of file formats. 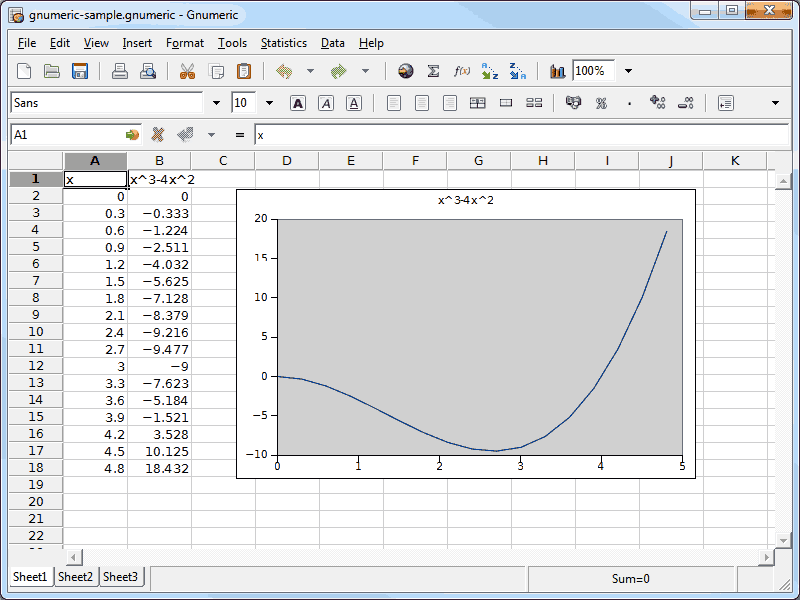 It supports all the worksheet functions in MS Excel, as well as many advanced analytical and computation functions. Will open/edit files from a variety of spreadsheet programs including Excel, OpenOffice.org, LibreOffice, Lotus 1-2-3, and more. Cross-platform with clients available for Mac and Linux). Gnumeric Portable is a wrapper for standard Gnumeric. An alternative package is X-Gnumeric. How to extract: Download the self-extracting EXE and extract to a folder of your choice. Launch GnumericPortable.exe. Handle value formats for xlsx export. Improve xlsx import/export of rich text. GNumeric can open/edit/save over 20 formats, including .xls and .xlsx. Gen: Variant.Kazy.197178 (libxslt-1.dll) was blocked and removed by F-Secure !! Abykus Standard Edition is designed for business and scientific applications. The program is a "8191 row x 127 column x 16 sheets" spreadsheet that combines object-oriented functionality with traditional spreadsheet operations, allowing you to store multi-value data types (such as arrays and matrixes) in a single cell. Abykus has also replaced the standard "A1" cell naming convention with a notation that uses numbers (i.e. algebraic expressions) or even other cell addresses to represent a cell's row and column position. Includes import of CSV, TXT, DIF files; load multiple worksheets; dynamic cell addressing; 3D cell addresses; more than 150 functions; C-like Script Language. Note: Abykus has gone totally payware with V2.0, so I have made available the last free version for direct download. The program is adware and starts with an AD splash-screen. Nagware. It works but the begging screen and "help" pop up EVERY time you start it. Nagging doesn't make me want to buy it. It makes me want to use something else. You should too. Simple Spreadsheet is a very basic spreadsheet. It has minimal features, but does what it says. Tried this; it created a Registry entry, and that's not what you expect from a "portable" application. So I de-installed it.